American Indian Model Schools in Oakland are once again facing controversy, despite their high test scores. 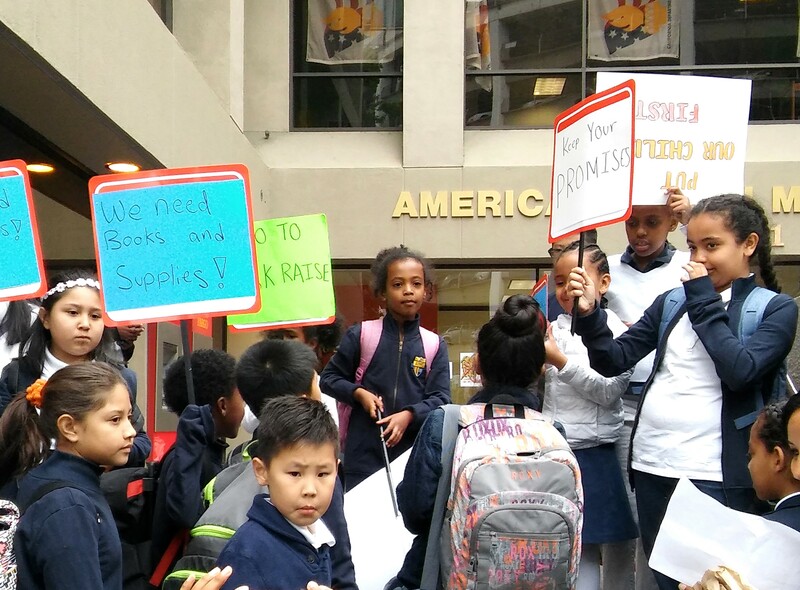 Students have been protesting at AIMS charter schools. American Indian Model Schools, which operates three public charter school campuses in Oakland, spanning kindergarten through high school, incurred a large budget deficit last year, and parents are questioning whether the administration is able to meet the needs of their children. Some teachers also say some of their colleagues have lost their jobs for speaking out about problems, including dilapidated school facilities and poor pay and benefits. As a result, they've decided to unionize. All of this is happening at a time when former AIMS Executive Director Ben Chavis is being prosecuted on charges of embezzling school funds when he ran the charter schools from 2006 to 2012. Many parents and teachers fear that any progress the school made after Chavis' departure is being undone by the school's current leadership. Parents complain that AIMS superintendent Maya Woods-Cadiz hasn't provided them with up-to-date information about the school's budget problems. According to Minh Co, Oakland Unified School District Office of Charter Schools accounting manager, AIMS ran a $338,071 deficit in the 2016-2017 school year. Even so, in March, board members voted in what may have been an illegal secret meeting to raise Woods-Cadiz's salary by $43,000 to a total of $185,000 a year. They also agreed to extend her contract by one year — all while school facilities have gone without basic repairs, according to parents. Many parents and teachers were outraged by the move. Most symbolic is the broken air conditioner at the school's downtown Oakland campus. Out of service for long periods of time over the past several years, the building becomes over-heated during school days. Staffers say children have broken out with nosebleeds and other health problems due to the stuffy, hot environment, and that it's extremely difficult for students to concentrate. At several board meetings last year, tempers boiled over with parents sweating and yelling at the school's executives while fans blasted them with hot air in the building with no air conditioner. At board meetings, many parents have taken to shouting and protesting. They have brought signs with messages such as "dismiss the superintendent." Yet despite the heated debate, the schools' boardmembers and superintendent say parents and teachers are overreacting and blowing minor issues out of proportion. "I know from an outsider's perspective, if people are being told things, they jump to assumptions," said Woods-Cadiz. "Our budget shows we have positive reserves." AIMS is no stranger to controversy. Founded in 1996 as a charter school designed to serve Native American children, the organization lost its charter in 2013 after a state audit concluded that its former leader, Ben Chavis, had directed about $3.8 million in school funds to companies he owned, including a real estate business that owned the school's former campus on 35th Avenue. That building was riddled with problems and didn't meet basic school facility requirements, forcing a move. AIMs purchased the building it currently inhabits on 12th Street in downtown Oakland from Chavis in 2014 for $7.5 million. Only after Chavis stepped down from the organization did it win back its charter. Several close allies of Chavis who were on the AIMS' board were also forced out. Since then, the school has been trying to distance itself from the past. But parents say they feel the board has been operating recently in ways reminiscent of the Chavis era by making secretive and damaging financial decisions. Parents "don't feel they have a voice — that was a major complaint during Ben Chavis' term," said Silke Bradford, director of charter schools for OUSD. "It looked like the new AIMS post-Ben Chavis was making improvements in that area — it appeared to be that way — but this last six months of complaints seems to indicate that the progress they have been making around parent voice may not be as robust as we initially thought." Many charter schools experience a disconnect and poor communication between their boards and parents, Bradford said. Having a self-selected board causes many families to feel as if they're blocked from the governance process, and it's difficult for dissident parents to have their voices heard because there are no elections. Instead, the board selects its own members. "Charter law never entertains the idea of charter families electing charter board members. I think that's a flaw in legislation that I'll be advocating for change, as it becomes frustrating for families who feel they're not being served by a board, and they have no say or impact over whether that person continues to serve or not," Bradford said. Since January, OUSD officials have sent 10 notices of concern to the AIMS board. OUSD sends out notices of concern after it receives enough complaints or information suggesting a potential violation of state law or district policy. One of the notices criticized a special closed meeting held in March to discuss the superintendent's salary. This meeting, according to one of the warning letters from OUSD, was a potential violation of the Ralph M. Brown Act, which states that public entities are required to conduct activities in an open forum. Parent Kevin Le said that when he and other parents "found out about that secret board meeting where the superintendent asked for a $43,000 raise ... we started asking a lot of questions." When asked why Woods-Cadiz's salary was discussed behind closed doors, AIMS board member Toni Cook said the board was trying to protect the superintendent's confidential personnel information. But in a notice sent to the AIMS board in June, OUSD officials wrote that closed meetings "may not be used to discuss salary," especially that of a high-level administrator. English teacher Joshua Peralta had been working at AIMS for barely a few weeks in 2014 when he started noticing problems. Peralta said after he was hired, he received no assistance from administrators in curriculum planning for coursework. He was also given inaccurate paychecks, which he claimed the AIMS financial department never corrected after promising him they would do so. "I started noticing there was a lot of strange things happening and kind of started questioning some of my colleagues, like 'Hey, is this normal?'" Peralta said. "Everything from curriculum planning to air conditioning to supplies to problems with paychecks — everything just seemed kind of screwy, to be honest." The school's disorganization and other problems has caused many teachers to quit after just one year on the job. Over the past two school years, the teacher turnover at AIMS was between 34 and 37 percent, according to the AIMS human resources department. One student, Kevin Ye, said he can no longer keep track of how many substitute teachers have come and gone through his classrooms. After several instructors who had criticized the school's administration were laid off, a group of AIMS teachers filed for union recognition with the California Teachers Association in February of 2016. "The organizing of the teachers was a big surprise," said Peralta. In 2017, the California Teachers Association, on behalf of AIMS teachers, filed three unfair labor practice charges against the schools. The first complaint alleged that AIMS refused to provide TAIMS, the union of teachers at American Indian Model School, information regarding the termination of a former AIMS employee. The administration was also unresponsive to a request to bargain over working conditions. Furthermore, the union alleged that school administrators attempted to intimidate a union supporter. The second complaint alleged that AIMS altered job descriptions and refused to negotiate with TAIMS on these policy changes. The third complaint alleged that AIMS unfairly changed the working conditions of its employees, altering the summer school schedule without engaging in proper negotiation with teachers. All three charges went to hearing in mid August, and an administrative law judge is expected to issue a ruling this fall. "We're working with the work relations board, our lawyers, and also with the union and organization to make sure we're doing everything we can to meet the needs of students, families, and our teachers," Woods-Cadiz said in response to the charges. "We value our teachers and so we are always working to make sure we're doing the right thing by them." Despite the teacher turnover problems, AIMS students continue to outperform traditional public schools and charter schools in Oakland. And while some parents have threatened to leave the schools, many say they would rather continue to fight than see them close. Bradford said that the district does not want to pursue a revocation, adding that OUSD's main goal is to address the needs and concerns of parents and hold the AIMS board accountable to "be transparent in their governance." Peralta also has no plans to leave AIMS immediately. He said he decided to stay for this school year to help strengthen the union, adding that the quality of students and teachers is one of the factors that motivates him to continue working there. "It's students, it's colleagues, it's to get the experience to make some change that will affect our students, teachers, and will make the school a healthier school," Peralta said. "It's not a very healthy school. You have to wonder at what expense is this happening." How Serious is the Wild Fire Threat in the Oakland Hills? Residents concerned, frustrated after loss of funding for prevention and reports of shoddy work by inspectors.